How often has this happened to you? You want to include your monster Soakys in your fireplace-mantel holiday display, alongside your Nativity scene and your Santa Pez. But somehow, the monsters just don’t seem festive enough. What to do? With this fun and easy craft project, you will learn how to create custom Santa hats for your monster Soakys. 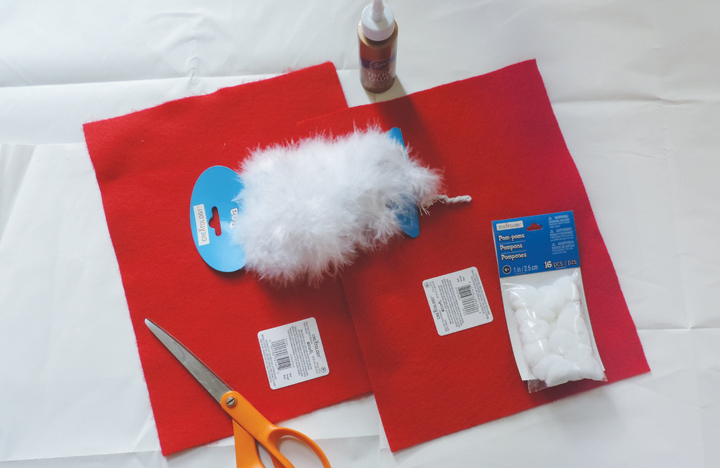 For this project, you will need two 9” X 12” sheets of red felt; four small white pom-poms; a miniature white feather boa (at least 40-inches long); scissors; and glue. (Note: We started out using Aleene’s Tacky Glue, which we found did not work well with the felt. We decided to switch to Testors Cement For Plastic, fumes be damned.) Time needed: 60 minutes. Cut felt sheets in half crosswise, yielding four 9” X 6” rectangles (as shown in photo left). Fold over each sheet to form a triangle (as shown in photo right). Trim unfolded material (as shown in photo left). The resulting squares will be 6” X 6”. Apply glue to one edge of square (as shown in photo left). Fold over another edge to form a cone (as shown in photo right). Hold tightly until dry. 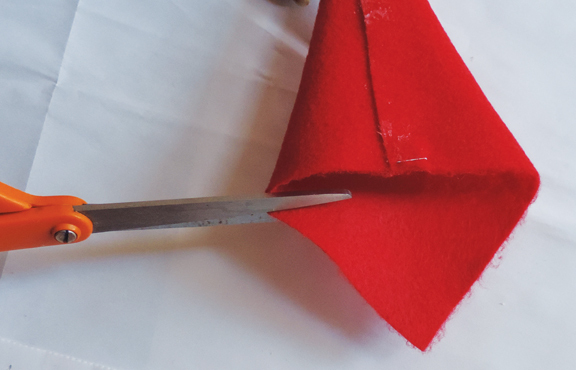 Trim the excess felt to make an even cone (as shown). Cut the boa into 10-inch strips (as shown in photo left). Glue the strips around the base of the cones (as shown in photo right). Snip a small opening into each pom-pom; insert glue (as shown in photo left). Place glued end of each pom-pom onto the tip of a cone; let dry. 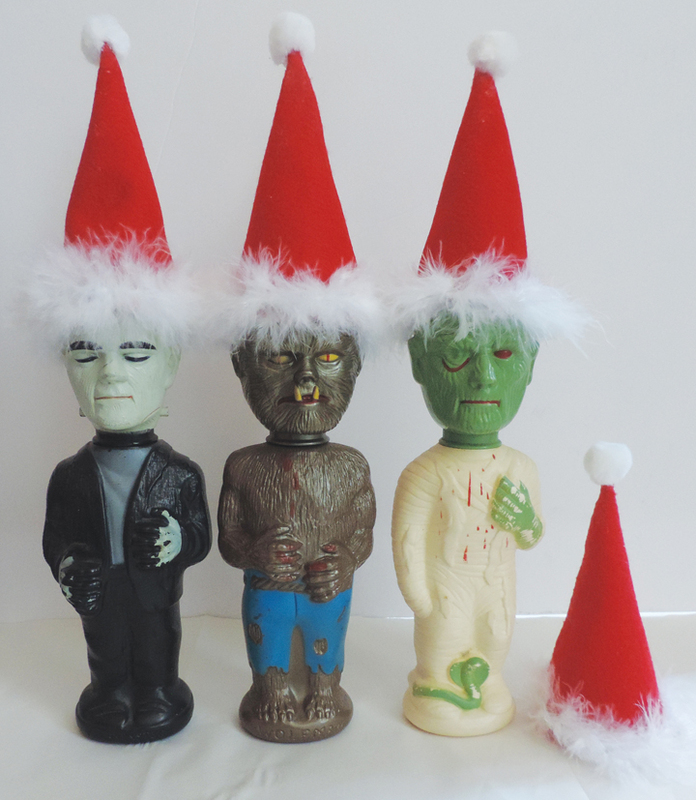 Your monster Soakys are now ready to don their holiday headwear. 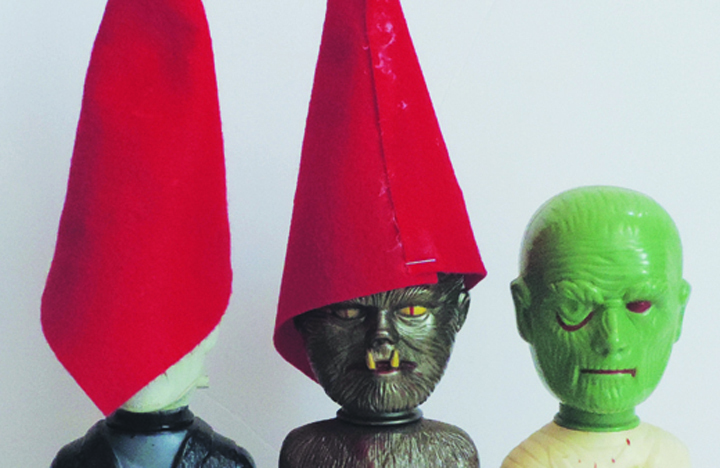 Even if you only own one monster Soaky, make four hats. You never know what will be under the tree on Christmas morning! Bonus: Since we’re in a “Monsters’ Holiday” mood, click on the videos below! First is the complete 1959 film “Santa Claus,” a Christmas movie made by Mexican monster-movie specialists. 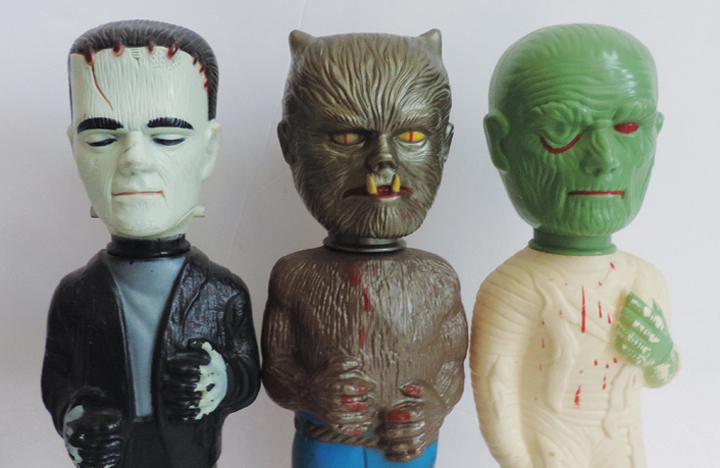 Then listen to “Monsters’ Holiday,” the 1965 single put out by Lon Chaney Jr. Sounds like ol’ Lon was hittin’ the egg nog!